4 Stars of Gothic Tales of Gargoyles vs. Demons with Frankenstein's Monster in the middle. 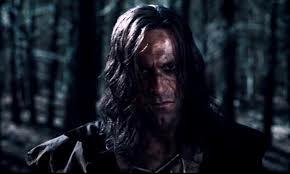 For Stuart Beattie's, (Pirates of the Caribbean, Saga) second film (mainly a writer) he has come up with a twist on the legend that is Frankenstein's monster. Set after the death of Victor Frankenstein, (Aden Young, Killer Elite) in a frozen region of the North, the monster heads back to the scene of his crime (the murder of Victors Wife Elizabeth) and buries Victor in the family plot. What he doesn't know is that demons know of Frankenstein's work and wish to use the knowledge written in his personal journal, written two years earlier in 1793. He is attacked by the demons as he starts to fill the grave. He tries to fight them off and manages to kill one of them, resulting in a fireball, when out of the night sky two Gargoyles, Ophir, (Mahesh Jadu, The Three Ages of Sasha) and Keziah, (Caitlin Stasey, Tomorrow, When the War Began) that had been standing position on a nearby building swoop down and destroy the remaining demons. Available to Buy on DVD, Blu-ray and 3D Blu-ray on the 26th May.